OSLO, Norway (AP) — An Afghan teenager who lost both legs in a cluster bomb explosion helped persuade his country to change its stance and join nearly 100 nations in signing a treaty Wednesday banning the disputed weapons. Afghanistan was initially reluctant to join the pact — which the United States and Russia have refused to support — but agreed to after lobbying by victims maimed by cluster munitions, including 17-year-old Soraj Ghulan Habib. The teen, who uses a wheelchair, met with his country's ambassador to Norway, Jawed Ludin, at a two-day signing conference in Oslo. 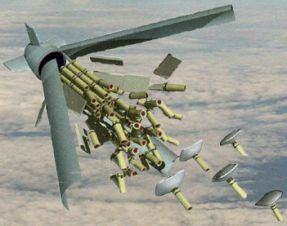 The U.S., Russia and other countries refusing to sign the treaty say cluster bombs have legitimate military uses, such as repelling advancing troop columns. Cluster bomblets are packed by the hundreds into artillery shells, bombs or missiles, which scatter them over vast areas. Some fail to explode immediately. The unexploded bomblets can then lie dormant for years until they are disturbed, often by children attracted by their small size and bright colors. The group Handicap International says 98 percent of cluster-bomb victims are civilians, and 27 percent are children. The teenager mentioned in the news story is not the one I've pictured. The photo comes from journalist John Scully's web site, Am I Dead Yet?